I was on the plane home from London, England on August 17. I was there for most of the summer — six weeks for an internship with CBC, and another week with my best friend, Sarah, to spend some time in London and Paris. On the plane home, I felt as if I were on a precipice, overlooking an expanse of something I’d never seen. It was, by far and away, one of the most transformative summers of my life. I encountered God in ways I never had before. I was with him in Hyde Park, or on the tube, or when I picked up a latte from the coffee cart across the street from my office. Each day I woke and wondered aloud, “What plans do you have for us today, Jesus?” and each day it seemed as though he revealed something new. I was nervous to go home — feeling as if London might be the only place I could possibly encounter Jesus in this fresh way. Hamilton represented familiarity to me, and although I was longing to hold my sister’s precious babies again, I was scared to lose this new part of me I had cultivated in England. I liked the Aliza I was there. I didn’t want to lose her. When Sarah and I walked out of Pearson airport, sadness settled within my soul. I missed London already. I greeted my family with exuberance, happily bathing Noah and Selah with attention, kisses, and an overabundance of gifts. I missed so many people while I was gone. We spent the next hour catching up. They told me about my Nana’s funeral, and I told them about the stories I covered. I was exhausted from jet lag, but I didn’t care. My niece had grown so much; I did not want to let her go. I was holding Selah when my dad rounded the corner, his phone in his hand. His expression was one I hadn’t seen before. “I think Tat’s been killed,” he said. “What?” My mom, sister, and I all turned toward him. “I think she’s been in a car accident,” he said, looking down at his phone. Tat Blackburn was my friend first, but over the past few years she got to know each person in my family well. We all loved her. “What?” I said again. I stood up. My face was wet. I realized I was squeezing onto her too tight. I gave my niece to my sister. When she was released from my arms, I wished I had something else to hold. I sat down again. Tat was engaged, and my family is friends with her marriage counsellor. Their counsellor was the one who texted my dad. Tat and her fiancé were driving home from Saskatchewan through Wisconsin when the accident took place. My mom stood, crying. Olivia rocked the baby, her face pale, her eyes huge. All of our thoughts were the same: how can this be? Tat was twenty-years-old, engaged to be married, her whole life a blank canvas before her. Immediately I thought of her parents, her brothers, her best friend, her fiancé. I shook my head in disbelief. This could not be true. I would not believe it. Tat was fine. We had spoken over Instagram days earlier while I was still in London. We had plans to get together when I came home. She was going to walk down the aisle on October 22 and marry the boy she loved with all her heart. This could not be true. I stopped crying. I refused to believe it until I got some sort of proof. My denial went so far as to hope she had been kidnapped. My mind knew that was irrational, but still I could not bear to think of anything else. Tat’s dad called me that evening. When I saw him calling, my heart dropped. I knew it had to be real. We cried on the phone together. I did not know you could hear someone’s heart break. But I heard his break from across the ocean. The next morning I woke up with my eyes swollen shut. I had dreamt of Tat all night, and wasn’t sure if I had actually slept. Two of my friends got married that evening. I knew Tat’s own wedding would never take place. I tried to blink thoughts of her away and lean into the celebration of my friends. I was a range of emotions I had never experienced before, all at the same time: ecstatic for the celebration of my friend’s love, and yet shattered in a way that felt physical. It was hard to breathe, as if pieces of my fractured heart had gotten tangled within my lungs. I could not tell if I was exhausted from jet lag or grief. I drank more than I should’ve. I was a sad cliche. We had a memorial service for Tat at church the next day. Tat was a founding member of our church, Mountainside. It turns two next week, and Tat was there from the very beginning. I swore at God as I drove the country road to church that morning on August 19. I pounded my fist against my steering wheel. I cursed. I screamed. Tears streamed and I rubbed them away. I drove too fast. I wanted adrenaline. I wanted anything but the pain that dug its fingernails into me. Our church collapsed in our grief together. We prayed for one another. We told God we didn’t understand. I still don’t. I still say that often. I grew angry at many people at church. I felt like they couldn’t possibly comprehend how I felt. I did not want to be touched, or hugged, or comforted. I held my baby niece that Sunday, rocking her to sleep. I drew circles on her back, one after the next, over and over. I sat on my own because I did not know what to say to the people around me. How are there ever words to express such immense sorrow? I went home and slept because I didn’t want to be awake any longer. I wore red lipstick and my hair in a half knot because that’s always how Tat wore hers. Thousands of people came. Pride swelled within me as I saw the impact she made on the world begin to seep out in a tangible way. The church was decorated beautifully. Later I learned the decorations were based off how her wedding was supposed to look. White flowers sat on top of her casket — the same flowers she would have carried two months later in her wedding bouquet. We buried her the next morning. I whispered our last words on earth before laying down a white rose. It has been almost two months since Tat died. I dreamt about her every night for a month straight, and the first morning I didn’t dream about her, I cried. 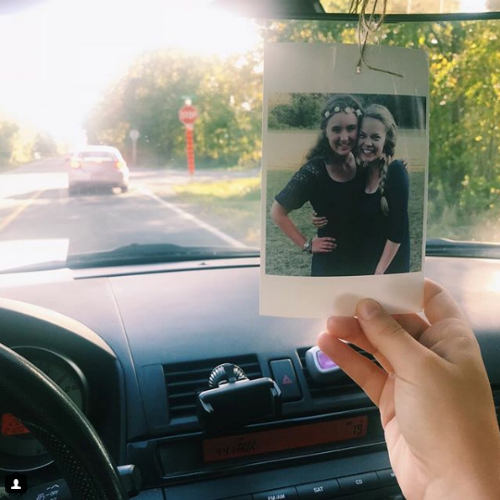 I looped a piece of brown string through a Polaroid picture — my favourite one of the two of us — tying it to my rearview mirror so I can see her each time I’m in my car. I didn’t know if I could write about her. It felt cruel to try and boil down her beautiful life to a measly blog post, as if I were trying to give people an encouraging lesson amidst her death. Even the best writer in the world could never fully express the magnitude of Tat’s life. I still need some time before I can even try. There came a point early on in my grief where I had to determine who God is. In London, I was blown away by his goodness. He continually impressed his love into every fibre of my being. When I arrived home and heard about Tat’s death a mere hour later, I wondered if the summer had been some sort of hoax. It took weeks. I held this question in my hands, rolling it around like you do with a pair of dice. I weighed it, turning it over in my mind day after day. I believe God never changes. So if I believed that, either God was bad all along and London was just some giant trick, or even in this tragedy, God remains good. It took me a long time but I truly believe the latter. Even in my grief, I celebrate his kindness. Especially in my grief, he is kind to me. The day after Tat died, I had a dream. I saw her with Jesus. She was wearing a white, gauzy dress, and her hair was long and flowing even though she’d recently cut it. Her hand was entwined with his, and her facial expression was one filled with a kind of adoration I had never seen here on earth. Jesus was gazing down at her, delight pouring like sunshine from all of his facial features. I could feel the warmth radiating from him, even though I knew I was not there. Tat’s smile extended, and she tilted her head back.